This article appears in Fall 2006: Issue No. 7 of Edible East End. 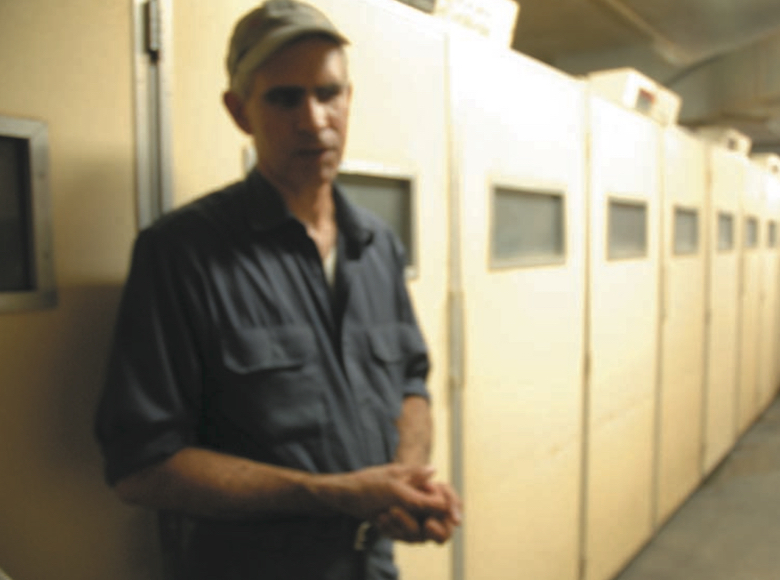 Doug Corwin among his birds in the breeding pen. These are tough times for the Long Island duck industry. At one time more than 70 duck farms flourished in Suffolk County. Now there are three: the Jurgielewicz farm in Moriches, the Massey farm in Eastport, and the largest of them all, Crescent Duck Farm in Aquebogue. Doug Corwin among his birds in front of the incubating closets. One month out of three, the operation concentrates on singling out good breeding birds. The process is a mixture of science—ultrasound techniques and health examinations among them—and good old fashioned eyeballing. The way the potential breeding duck is feathered is all-important, since it helps determine the number of eggs she may lay and how many of those eggs will hatch. 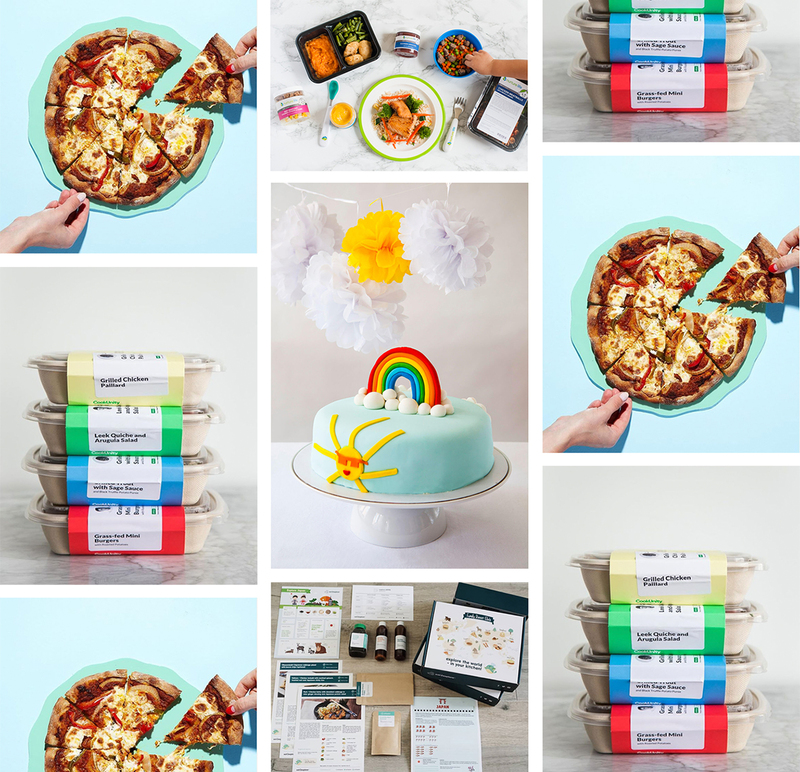 “We also want to promote meat characteristics in the female line,” said Corwin. A good breeder is usually selected at four weeks of age and will first breed at around 25 weeks of age in an outside pen where there is one male for every five females. 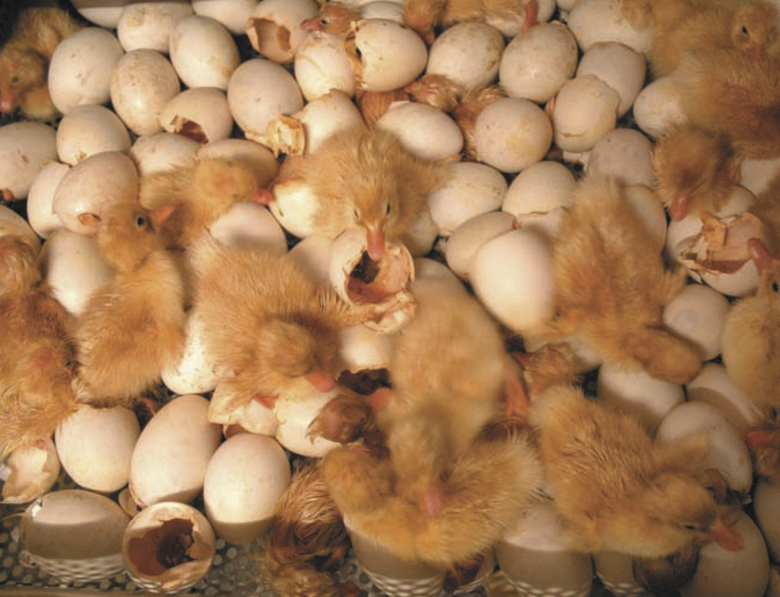 Drawers of chicks ready to hatch. sound. Corwin says the marshlands provided useful plant materials that could be used for thatch, for example, but little else until the fortuitous arrival of some Pekin duck eggs from China in the late 19th century hatched the Long Island duck industry. (The apocryphal story claims that an American businessman traveling in China mistook the large ducks were miniature geese and thought they might be a novelty in the States.) 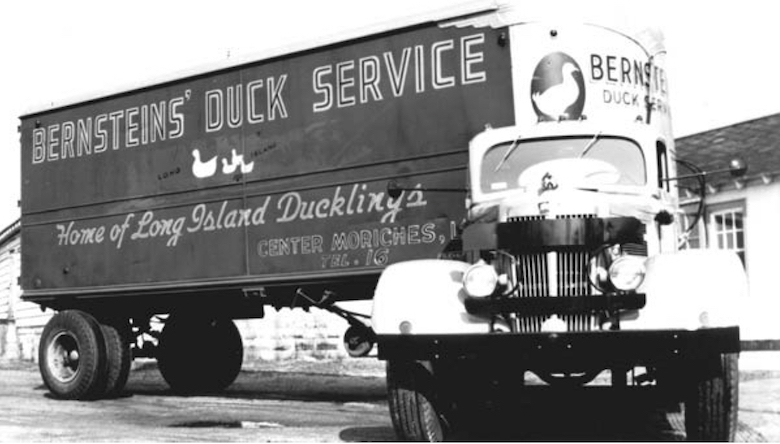 Great grandfather Henry Corwin took up duck farming at the beginning of the 20th century in the wake of a number of other duck farms that had been established in the Riverhead area and would later give way to an industry famous throughout the nation. Long Island duck became a household name, benefiting partly from some unique characteristics of Suffolk County that were particularly conducive to the duck business. First, says Corwin, it’s a wonderful growing climate. “We never have a really hard freeze, summers are generally not tremendously hot, and we have ground water.” And then there’s the history. Corwin has certainly had plenty of practice in the duck business, not to mention the sage advice of his father (still at work at the age of 75). Beneath its high-tech veneer, Crescent remains a family business that includes Corwin’s brother and sons as well. Another reason is strict environmental regulations that politicians and citizens have developed over the last 40 years. The same gluttonous appetite that makes ducks great for raising also means they generate massive amounts of waste. Over the years, the streams that had proved so beneficial for the raising of ducks became badly polluted with duck waste, which eventually flowed into the bays, prompting the County and State to implement strict environmental regulations that put most producers out of business. 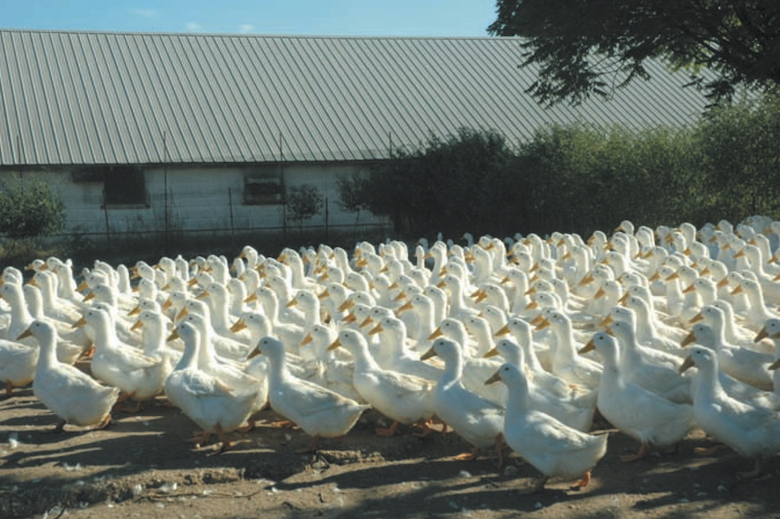 Duck farming peaked on Long Island in the 1940s at just about the same time that duck growers petitioned Cornell University for its assistance in conducting scientific research into duck nutrition, disease and management. The Duck Research Laboratory was established in Eastport, Long Island, in 1949. 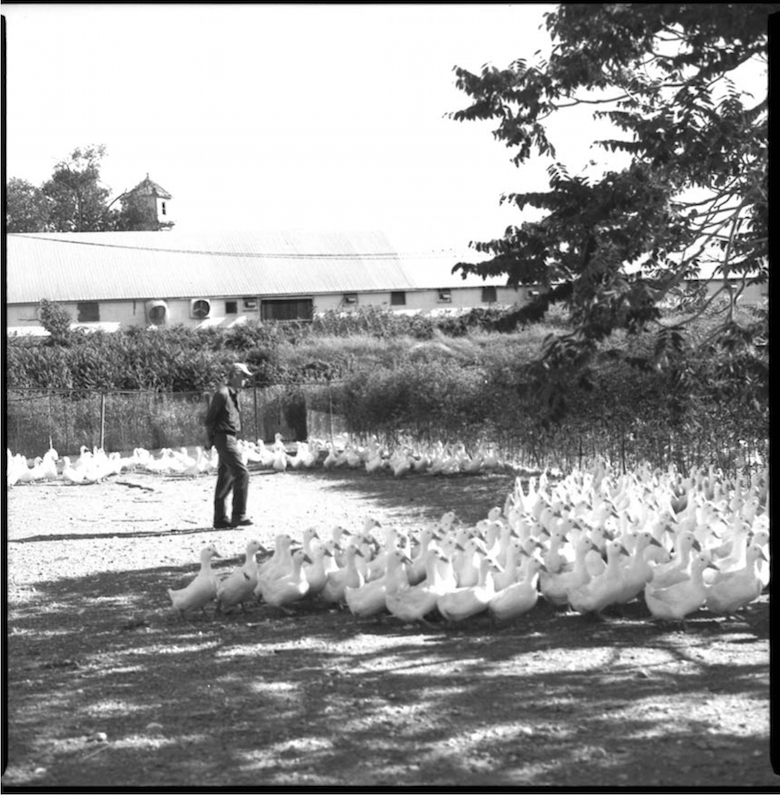 Corwin remembers two dozen duck farms within a ten-mile radius of Aquebogue through the 1950s. By the early 1990s, however, local membership had declined and the cooperative had opened its doors to national and international members. 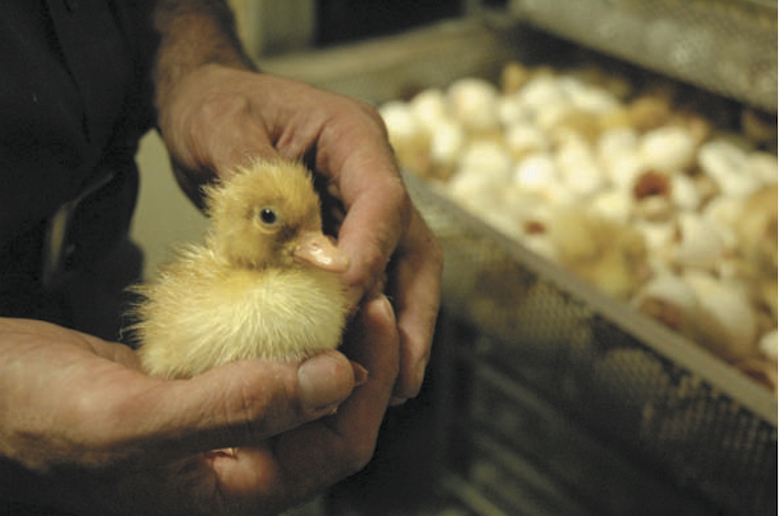 In 1992 the organization’s name was changed to the International Duck Research Cooperative, reflecting the spread of duck farming to the Midwest and Canada. Crescent is fortunate to have 140 acres on which to raise its product. There are barns for every phase of the product cycle. Corwin would like to replace the hatcheries with a more modern facility. Indeed, some of the barns have been around a long time, including one that was constructed with timber salvaged from the Second Avenue elevated train. The spread includes plenty of space for young ducks to range, but the ducks’ outdoor days are numbered. The threat of avian flu has accelerated a barn-building program that will house all of the farm’s ducks inside. “If the flu strain is found in North America, I’ll get them inside even if the buildings are incomplete,” says Corwin. Despite the possibility of a more limited existence for the birds, the farm’s prospects are ripe. Crescent ducks are shipped all over the United States and are found on the menus of some of the most highly rated restaurants in the country. The farm does its own shipping up and down the northeast corridor—which, like raising its own feed, has been an important part of keeping costs down. It contracts out shipping to its more remote markets, like Hawaii. “I’d rather be big in the Northeast than spread too thin,” said Corwin. From Cromer’s Market in Sag Harbor to Greenport’s restaurant row, Crescent supplies most of the duck on the East End. Boil the seasonings in the water for 10 minutes. Cool completely. 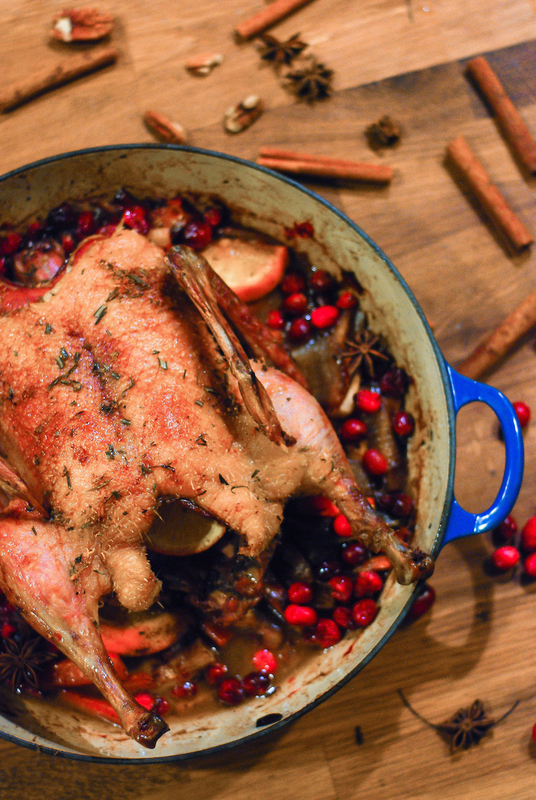 Remove the excess skin and fat from duck and prick the skin with a fork on the sides and bottom. Submerge the duck (or more than one duck) completely. Brine for 2-4 days in the refrigerator. Make a paste with a mortar and pestle or grind in a blender. Dry the duck completely and rub with the paste inside and out. First roast breast-side down for 45 minutes at 375 degrees, then right-side up for 45 minutes at 375 degrees, basting with more seasoning paste for color.